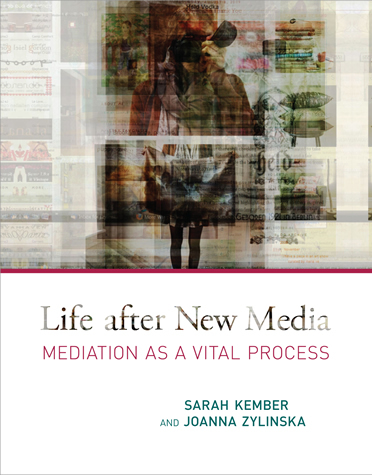 In Life after New Media, Sarah Kember and Joanna Zylinska make a case for a significant shift in our understanding of new media. They argue that we should move beyond our fascination with objects — computers, smart phones, iPods, Kindles — to an examination of the interlocking technical, social, and biological processes of mediation. Doing so, they say, reveals that life itself can be understood as mediated — subject to the same processes of reproduction, transformation, flattening, and patenting undergone by other media forms. By Kember and Zylinska’s account, the dispersal of media and technology into our biological and social lives intensifies our entanglement with nonhuman entities. Mediation — all-encompassing and indivisible — becomes for them a key trope for understanding our being in the technological world. Drawing on the work of Bergson and Derrida while displaying a rigorous playfulness toward philosophy, Kember and Zylinska examine the multiple flows of mediation. Importantly, they also consider the ethical necessity of making a “cut” to any media processes in order to contain them. Considering topics that range from media-enacted cosmic events to the intelligent home, they propose a new way of “doing” media studies that is simultaneously critical and creative, and that performs an encounter between theory and practice. Sarah Kember is Professor of New Technologies of Communication at Goldsmiths, University of London, and author, most recently, of The Optical Effects of Lightning. Joanna Zylinska is Professor of New Media and Communications at Goldsmiths, University of London, author of Bioethics in the Age of New Media (MIT Press, 2009) and other books, and a fine-art photographer.